Desmond Cole knows a lot about ghosts. After all, he created the Ghost Patrol. Desmond is sure that ghosts don't ride bikes but his new friend Andres doesn't know what to think. Something strange is going on at the bike park and Andres wants to get down to the bottom of it. Not one kid at the bike park has managed to land the Kicker, the biggest jump at the park. The strangest part about it is that every kid falls off the bike before the jump but their bike keeps going to and crashes on the other side. 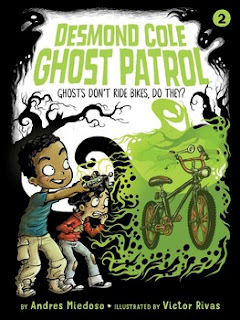 Andres enlists Desmond's help and they discover a ghost is knocking kids off so he can ride their bikes over the hill. The ghost mystery doesn't stop. When all of the bikes disappear the next day from school. Andres and Desmond set out to find the culprit. Another surprise about ghosts awaits. The early reader may want to form his own ghost patrol and help solve the mystery. Though lacking some character development and not as strong as the first book in the series, the reader will still enjoy the ghost antics and look forward to the next installment.